The main priority of just about every living thing found on Earth is to reproduce. The measures that some animals will go to in order to make this happen can be fascinating to discover. 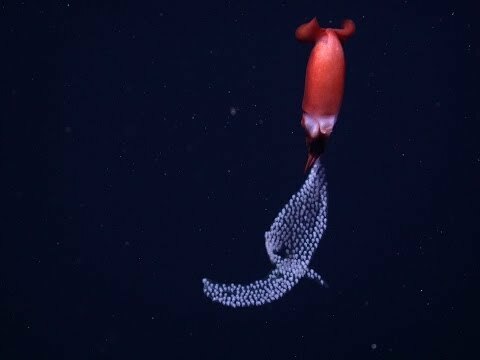 As it turns out, squid have some of the most unique reproduction and parenting techniques that have ever been seen by any scientist. Something Completely Unexpected Was Discovered In 2014 When A Group Of Scientific Researchers Sent A Remotely Operated Vehicle (ROV) Into The Ocean To Do Some Filming. A "sheet" Of Eggs Was Captured Through The Camera Lens Tightly Secured To A Mother Squid That Was Just 4 Inches Long. Unlike Other Cephalopods Who Let Their Eggs Float Away Or Attach Them To A Nearby Rock Hoping For The Best For Their Babies, This Mother Squid Was Keeping Hers Safe And Secure. Before This Discovery Was Made, Scientist Where Unsure How Squid Living In Deep-sea Regions Were Able To Reproduce Successfully. It Was A Magnificent Addition To Science! Nobody Loves Babies More Than Their Own Mother. Living Metal Snails Discovered Miles Below The Ocean's Surface, And They Have Superpowers! Did 'Crusty' Eat The Pie(lot)?! 27 Weird And Wonderful Animal And Creature Lifespans- That May Surprise You! Think You're A Law-abiding Model Citizen? You Might Not Be.